It’s weeks like this that make me want to hang up my consulting shoes for sure. Storms have intermittently snarled air traffic in the Midwest, making it hard for my partner and me to get to clients. Fortunately, since we work for ourselves, we have the ultimate authority as far as rebooking and rerouting and can decide whether we want to absorb the cost of a new ticket or stick it out. On Monday, I was surrounded by business travelers who weren’t as lucky as I overheard several frantically calling travel agencies or seeking management approval to reroute their flights. As the week progressed, I did my fair share of sitting on the tarmac and also had one round of going back to the gate. Early summer travel is always dicey (especially if you have to go through Chicago) and my plans to avoid it never seem to actually happen. I was optimistic yesterday morning, as I found a seat on an evening flight that would allow me to avoid leaving my hotel at 4 a.m. to catch a 6 a.m. flight to the next client. The only wrinkle was that I had to arrive at a different airport than originally planned, but that seemed OK since the client is halfway between two major airports and the drive time from each is about the same. I could arrive at my destination airport at 10 p.m., hop in my rental, drive for an hour and a half, and still get a good night’s sleep. My friends at my favorite hotel chain were happy to waive any early check-out penalty because I was booking the night at another hotel in the chain. Little did I know that the travel gods were going to make up for my seemingly good decision in a multitude of ways. I arrived at the rental car vendor to find that there were no cars. Seriously, none. The staff was kind and offered bottled water while we waited for vehicles to be brought around. There were six of us who had come off the shuttle bus from my flight, all of us had reservations, and our flight was on time, so I’m not sure why it was a problem. Since I wanted to get to my hotel to crash, I took the first car available and headed for the exit. All was smooth until exited the airport proper and immediately got nabbed running a red light. It was a large intersection and the light turned yellow right as I entered it, but it went red while I was in the middle of it. I’d chalk it up to bad luck, but there were three other cars that also got caught so I think it’s a timing issue on the lights. Regardless, I’ll be looking forward to a ticket in the mail in a couple of weeks and really didn’t need to add that to my to-do list. I finally made it to the highway and settled in. I knew that I was going to have to be on toll roads, so I came prepared with cash. What I didn’t know is that the toll roads were coin-only, unattended. At the first one, I didn’t have the right change but made note of the website where I can supposedly go online and pay later. At the second booth, there was an attendant, but I was so flustered by the previous incidents that I forgot to get a receipt. Depending on who you work for, there’s no reimbursement without a receipt. I’m not going to quibble about a couple of dollars, but was just annoyed at forgetting it. At the third booth, I remembered to get a receipt, so thought victory was just around the corner. Sure enough, a fourth booth (again, unattended and coin-only) loomed. 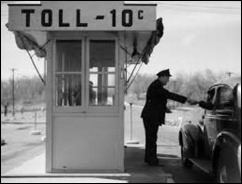 I had planned ahead at the previous attended toll booths by making sure I got my change in quarters, so I was ready. There was a car in front of me whose driver was clearly digging through the console for change. He’d come up with a coin, throw it in the basket, and start digging again. I had my window down ready to throw my quarters in when it was my turn and could hear when he started cursing and yelling. Apparently he had thrown in enough change and it still wasn’t changing his status from “Stop!” to “Thank You” and he was getting agitated. He was reaching out and punching the toll basket. The yelling was getting louder and at one point half his body was out the window. His car was shaking from side to side because he was a big guy and he was getting really, really agitated. Needless to say I put my window up – there’s nothing quite like being trapped in a line of cars with someone acting strangely near you and you know you can’t get away. Given our current times, I wasn’t sure if he was going to end up shooting the toll station or what. He finally drove through. I confidently tossed my coins in the basket and waited for my “Thank You” and never got it either. By now it was well past midnight, I was tired and agitated, and I just drove through, thinking I’ll sort it out on the website later. Clearly the booth wasn’t functioning correctly, but what can you do at that point? I thought back to my exit from the rental car lot – they didn’t even offer the magic toll pass option, but I promise if I ever have to rent a car in this city again, I’m definitely asking for one. I arrived at my hotel well after midnight, but luckily check-in was uneventful. The travel gods did finally reward me, though, with the best hotel water pressure I’ve had in a long time. People without long hair don’t always appreciate the value of ridiculously high shower water pressure, and people who aren’t on the road day in and day out may not understand the value of the little things when you’re away from home. When I got to my room, I found dozens of emails waiting for me and am now addressing them intermittently while I eat breakfast and get dressed. For those organizations who work with consultants, it’s good to understand what your hired help might have been through to get there. If they look less than rested, there’s a reasonable likelihood that they had a hard day of travel rather than staying up watching Netflix and surfing the net. (Of course I’ve had the latter kind of days too, but they’re extremely rare.) So offer them a cup of coffee and a comfortable chair (my current one at the hotel doesn’t adjust up enough to reach the desk correctly, so I’m getting tingly nerves as I type this) and let them get to work. Don’t assume their travel has been glamorous and ask them to tell you about it. You might just get more than you bargained for. What’s your worst travel day story? Email me. Make no mistake, Bain’s strategic investment does meet the definition of acquisition for Navicure. JMI wanted out and was very patient for a VC firm (5+ years). The total investment allows all stockholders to cash out. Management team stays in place for the near term. With Bain having a majority interest, it will be interesting to see the impact over the short and long term.